The Handlery Hotel, 5:30 p.m. In this presentation, Prof. Jose Restrepo will highlight the 10 years of research achievement of the NEES-UC San Diego Shaking Table. Numerous landmark research projects have been carried out on the shaking table, resulting in discovering of new knowledge and advancement of design codes. In particular, Prof. Restrepo will highlight the research project on thin structural walls, and will contrast its main findings with observations made in the M8.8 Chile earthquake. He will also show the research project on precast concrete diaphragms and will briefly discuss the main changes to ASCE 7 that this research work brought up. Furhtermore, Prof. Restrepo will highlight the main findings of the research project on a fully equipped 5-story building, which was tested with base-isolation and then and then in a fixed-based condition. Prof. Restrepo will end its presentation with a brief discussion of a building project whose design aims at reducing floor inertia forces. This building is being currently tested on the NEES-UC San Diego shake table. Jose. Restrepo is a Professor in Structural Engineering at the University of California, San Diego. Professor Restrepo research interests are in earthquake engineering and structural dynamics, with emphasis in structural design and experimental methods. Professor Restrepo was lead structural engineer for the NEES UC San Diego Large High-Performance Outdoor Shake Table, the largest in the United States and second largest worldwide. There he has leader or collaborator for a number of landmark experiments performed on this shake table. Prof. Restrepo’s research has been recognized with the ACI Chester Paul Siess Award, the PCI Charles C. Zollman and Martin Korn Awards, the FHWA James Cooper Award and the ASCE Alfred Noble Award. and SEAOC Executive Director, Don Schinske, will be visiting SEAOSD for this dinner meeting! PAYMENT: Cash, check or credit card (click on the “register now” button below). Parking will be validated. Checks made payable to SEAOSD. You may mail your check in advance to 401 W. Lexington Avenue #12621, El Cajon, CA 92022. RESERVATIONS: MUST be received by Friday, January 17th, Noon. If you choose to walk-in the day of the luncheon, please be advised that your meal is not guaranteed and an additional charge of $5 will be added to the cost of the dinner. If you make a dinner reservation and fail to attend you will be invoiced. By Phone: 619-212-5210 E-Mail: secretary@seaosd.org, or by responding to the email invitation. CANCELLATION: Please CANCEL your reservation(s) at least 24 hours in advance if you are UNABLE to attend. We are proud to announce San Diego State University’s student chapter of the American Society of Civil Engineers (ASCE) will be hosting the 2014 ASCE Pacific Southwest Conference (PSWC) from April 3rd to April 5th. A total of 19 ASCE student chapters, professional industry engineers, faculty advisors, and volunteers will be attending this exciting event. Students will apply their civil engineering knowledge and team dynamics to the test by competing in a variety of activities such as Concrete Canoe, Steel Bridge, Surveying, Geotechnical, Quiz Bowl, and much more. At this year’s ASCE PSWC, our student chapter ranked 6th out of 17 schools. We are very excited to have another successful year on our very own campus! Our goal is to make this conference the most memorable experience! As the host of the 2014 ASCE PSWC, we are responsible for planning, budgeting, and running the entire event. Our projected expense budget is $112,000. We are in need of raising $22,000 through sponsorships and fund raising events. Funds would be used for venues, catering, apparel, conference materials, printing/advertising, and making initial deposits. Enclosed is our sponsorship registration form. Your donation would help us achieve our financial goals. 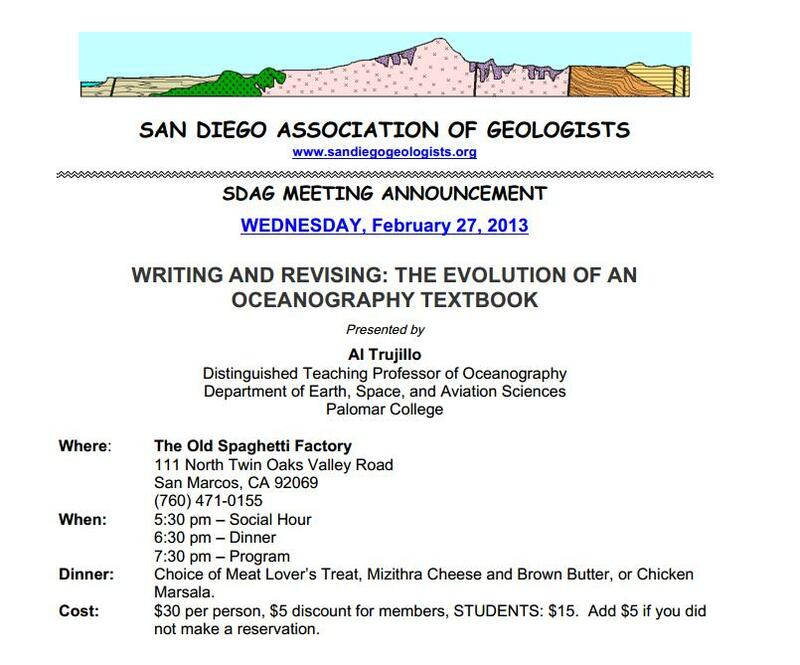 Our friends at the San Diego Association of Geologists (SDAG) have announced their next dinner meeting. Please visit the link below for more information.